China’s ‘Belt & Road Initiative’ dilemma. China’s rise as a global power and leader of multinational initiatives is compelling the Communist Party of China (CPC) to find compromises between its domestic policies and international priorities. Among the compromises that the CPC has to make are issues related to ethnic identity and religious rights. Domestically, the CPC wants to implement ethnic and religious policies that, particularly in the case of Chinese Muslims, are aimed at significantly weakening their religious and ethnic identities, while fomenting an increasingly homogenous and stable Chinese society. Internationally, however, the CPC has to communicate with governments and people who have strong Islamic heritages, making Chinese Muslims with a robust Islamic belief an irreplaceable and valuable resource. This is because Chinese Muslims can help Chinese representatives avoid misunderstandings resulting from intercultural exchanges and facilitate the people-to-people interactions needed to make multinational initiatives successful. President Xi Jinping launched China’s “Belt & Road Initiative” (BRI) in 2013 with the aim to interconnect major economies in Asia and Europe through infrastructure, investment, and trade. As shown in this map, the initiative can be divided into a land-based economic belt and a maritime route. The economic belt refers to a vast network of rail and road routes, as well as natural gas and oil pipelines that mainly connect China’s Xian city to Europe through Central Asia, but also countries found along the belt, such as Mongolia, Pakistan, and India, among others. As for the maritime route, it refers to a network of coastal infrastructure, such as ports, that will link China to East Africa and Europe through South and Southeast Asia. Given the eclectic economic, political, religious, and cultural backgrounds of the countries involved, it is fundamental for China to adapt to this complex environment if it wants the BRI to be successful. More importantly, China has to familiarize itself with Islamic beliefs and cultures because many of the core countries along the BRI are of Islamic descent: the Central Asian republics, Iran, Turkey, Indonesia, Malaysia, and Middle Eastern countries among others. China will continue to firmly support Middle East and Arabic countries to maintain their ethnic culture and tradition, and reject any discrimination and prejudice against certain ethnic group and religion. To provide the necessary understanding of Islamic beliefs and values, and to facilitate the people-to-people interaction between Chinese actors and countries with Islamic heritage, the CPC has a unique resource: the Chinese Muslims. 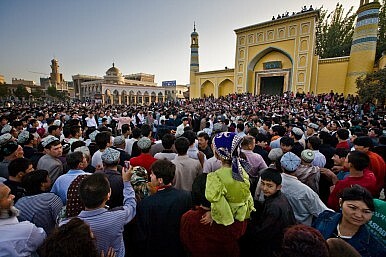 Chinese Muslims’ religious, cultural, and, in the case of the Uyghurs (Fig. 2 below), linguistic similarities with the numerous Islamic countries along the BRI, make them a precious and irreplaceable resource to make China’s flagship project for the 21st Century a success. There are at least four areas in which Chinese Muslims with strong Islamic beliefs and practices could contribute to the success of the BRI. One is to establish deep-rooted, long-lasting people-to-people relations with Muslims in other countries. Second, to help non-Muslim Chinese (97 percent of the Chinese population) interact more effectively with Muslims and avoid detrimental misunderstandings. In addition, Chinese Muslims can expand the existing specialized trade between them and Muslims along the BRI. Then finally, to provide the feeling of a common identity and environment to Muslims visiting China. Surprisingly, however, the CPC has been implementing policies and measures in Xinjiang, and increasingly elsewhere, aimed at achieving exactly the opposite: to reduce the Islamic beliefs and practices of its Muslims to mere superficial ritual practices. Given that Islam is perceived as an existential threat, the CPC has set extensive restrictions on the religious and cultural practices of Chinese Muslims, and in particular the Uyghurs in Xinjiang, because they also have territorial claims. As a result, many common religious practices—such as praying, fasting, following the Islamic dress code, reading the Qur’an, and refusing to drink alcohol, among many others—are labeled as “religious extremism” and increasingly illegalized. More recently, it seems that this trend to illegalize normal Islamic practices is spreading to other Chinese provinces with significant Muslim populations, such as Ningxia, Gansu, and Qinghai. Ultimately, the CPC believes that a reduction in ethnic diversity will foster a stronger Chinese national identity and a harmonious society. While temporary stability might be achieved this way, it will be fragile and prone to disruptions by those who have had their religious and cultural rights curtailed or denied. Furthermore, the loss of the Islamic identity of Chinese Muslims will be a significant loss for China as a whole. Therefore, it may prove beneficial for China not to approach the issue of its Muslim communities as a dilemma with two mutually exclusive options, but rather as an opportunity to achieve a more representative Chinese common identity. Ultimately, the “Belt & Road Initiative,” whose sustained success greatly depends on people-to-people relations, will undoubtedly benefit from a more inclusive and diverse China. Patrik K. Meyer is an International Security Fellow at New America, and Foreign Expert at the Dept. of Arabic language & Literature, at Peking University. This article has previously been published on the EastWest Policy Innovation Blog.